What is that squiggly green thing with the arrow you ask? Yes, it is some sort of abstract brain, but there is more to it than that! Abstract Brain: Of course, being a concussion nonprofit, we wanted some sort of brain included. However, we knew that a brain can be very complex (just think of all the gyri and sulci!) and is also not one of the most attractive images. We decided to create an abstract brain that was simple enough to wear on a shirt, hat, or helmet! The “squiggle”: We knew how unpredictable and uncertain a road to recovery can be. The “squiggle” part of the logo signifies the ups and downs those striving to overcome a concussion oftentimes experience. Arrow: Our squiggle ends with an arrow pointing upward to show that progress and recovery is possible. The arrow also complements the name of our nonprofit, Headway, which means to make progress. Color: Green is associated with growth and progress. Is it also a color that is very easy on the eyes -- something that many of us who suffered from concussion symptoms could appreciate! In January of 2016, co-founders Paige Decker, Josephine Pucci, and Danny Otto began brainstorming what a logo for Headway Foundation might look like. They wanted a unique design that represented Headway's identity as an organization and one that could be appealing for their target populations - those with post-concussion syndrome and athletic teams. They envisioned something that conveyed an understanding of the ups and downs of recovery, but also something that provided a sense of hope that progress is possible. How could they convey all of that in an image that they also hoped would be recognizable and simple enough to sport on athletic gear and other merchandise? After many brainstorming discussions and multiple revisions, a consensus was finally reached. The final product was a full team effort that would not have been possible without the creativity and dedication from two very talented designers (and friends! ): Alex English and Kai Takahashi. 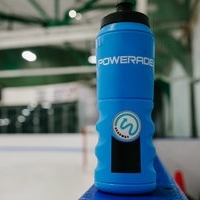 Alex, who is a former ice hockey player, had a sense of a type of brand that athletes might be willing to get behind. She grew up playing hockey in Connecticut and then competed at Berkshire School during high school. Alex then went on to study Graphic Design at Arizona State University and now works as a hockey uniform designer for Adidas, located in Portland, Oregon. Alex's first-hand experience with concussions compelled her to help with the cause. Alex states: "Hockey has given me so much in my life, I'd like to give back to the sport in any way I can, as it will always hold a special place in my heart." If you are interested in connected with Alex, please contact her at alxenglish.design@gmail.com! Kai's interest in design began very intertwined with his interest in sports. "I would trace the beginning of my design career (somehow going on 10 years now!) to my freshman year at Choate, where I won the t-shirt contest for the annual Deerfield Day athletic competition," says Kai. Through high school and college, he freelanced for groups of all shapes and sizes—including many athletic-related projects. Kai studied graphic design formally at Yale, where he created a poster series centered on concussions in football. Kai also spent two summers interning at the sports design agencies Brandiose and SME, and he now works as a product designer at Zume Pizza—where he designed softball jerseys for our inaugural team. Kai states: "I have been concerned with concussions for a while, after seeing [Danny Otto] and other close friends go through some pretty frightening and confusing experiences. I found Headway's mission of reframing the debate around concussions inspiring and necessary. Headway's position as a foundation started by athletes, for athletes is especially important, because the foundation operates from an inherent love of sports and making them safer,"
Check out Kai's website at www.kaideas.info! What is the proper way to wear the Headway Sticker? Check out the image to the right, which illustrates the proper angle to wear the Headway Sticker! Where should I put the Headway Sticker? Anywhere! Helmets, water bottles, laptops, etc. For all players and teams to rep Headway Stickers to illustrate a combined commitment to eliminating the "tough-it-out" culture when it comes to dealing with concussions and to openly show support for teammates who may feel isolated while striving to overcome post-concussion symptoms. How do I get my own Headway Sticker? Make the New Tough Pact and you can place an order for a free Headway Sticker.